Hello, hello! Good evening, everyone. This week has been good for me, but I’ve realized that I probably will not make my GoodReads reading goal this year. I’m honestly okay with that, though. I love reading, but I think the reason I have been in such a slump is because I’ve been pressured to read because of this GoodReads goal. In 2015 I think I’m going to set my goal at 50 books, rather than 62, but I’m going to not stress about it. 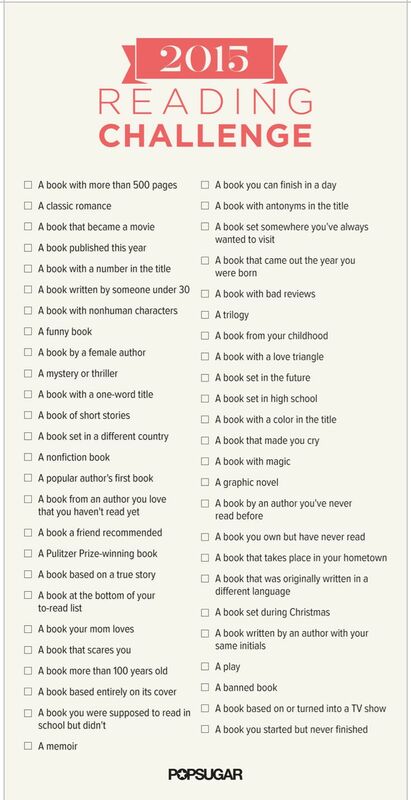 I have decided that I am going to do a 2015 Reading Challenge. It is a full year long challenge with a bunch of cool books to read. I found this challenge on Pinterest and am so excited, because I am going to really commit to this. I’ve never done anything like this, and I think it will be refreshing to take a step away from young adult. I love young adult, but I’ve found that almost all are the same. Dystopian, forbidden love, dire situations. But, branching out to adult, and non-fiction, fantasy. There are so many choices in books that are not YA. In the new year I will be trying to branch out. This weekend I’ve been sick with the flu. So puking my guts out, basically. I have read quite a few pages today, but I don’t think I really took in the story because of the whole vomiting thing. I’m currently reading Endgame: The Calling – James Frey and am really really loving it. Oh my, let me tell ya. Sarah and Jago are perfect. Christopher just needs to stop, and An and Chiyoko are great. Holy goodness sakes. Sarah and Jago. Mm. Shipping them so hard. If you’ve read this book you understand. Happy Friday! This week I’ve been reading Endgame: The Calling – James Frey. It is so good, but I have no idea how to do the puzzles online. I love the idea, but they are way to difficult. I don’t even know where to start with them, and I get why they would be so hard, but I have no idea how anyone could find them out. The book is very, very good, though. I am also currently reading Clockwork Angel by Cassandra Clare, but haven’t picked it up in over a week. Will Herondale, let me tell ya. He’s just like Jace…. but better. Yes, I said it. *faints* Update: I GOT MY FIRST CAR! It is a beautiful Jeep Liberty. She’s silver and her name is Luna. As in Lovegood. As in Harry Potter. As in letting my nerdiness show… again. Other than that, nothing really amazing has happened to me. If you like video games, my brother just started a YouTube channel about gaming. Subscribe to him: DannyusaGaming. He just started it today, but he’s super pumped about it :) Oh, and if any publishers would like to send me any ARCs I’d be cool with that. PO Box in the Contact Me tab. Merry Christmas Eve, everyone! By the title of this post, you know that the 200 follower giveaway is over! The winners are: *drum roll* Mia and Victoria! Congratulations to both of you for entering and winning some books! Mia won: Cinder (The Lunar Chronicles #1) – Marissa Meyer and The Girl of Fire and Thorns (Fire and Thorns #1) – Rae Carson, and Victoria won: I Am Number Four (Lorien Legacies #1) – Pittacus Lore and The Lying Game (The Lying Game #1) – Sara Shepard! I will email both of you and get addresses from there! Update of the week: I haven’t blogged in a while and haven’t done my weekly newsletters for a couple weeks, and I plan to change that! I have been in a slump for a while, but started reading Endgame: The Calling because my boyfriend got it for me for Christmas, and IT IS SO GOOD. Oh my gosh, it is an amazing book. I read 100 pages without even realizing it and I am so excited about the online game that comes with it. Also, I failed the Christmas BookTubeAThon. I failed so so much. I didn’t even start the first book on my TBR. Yeahhh, that happened. I had Nutcracker that whole week, so I don’t really blame myself for it. I’m very happy to be out of my reading slump, though. MERRY CHRISTMAS EVE! I am very excited for Christmas this year and cannot wait until my family comes. My mom and I have been wrapping presents today and it just makes me happy :) Tell me your reading plans for Christmas break below! Happy Friday, everyone! Today was the last day of school before Christmas Break! Last semester test is finally done. I feel like I did really well on all of my tests, and it’s a relief to have them done. Today is the first Nutcracker performance! We have been practicing all this week and it’s very exciting because we get to finally perform for people! My giveaway was extended, and there are only 12 entries so far. It is open for another 15 hours, I believe. Enter Enter Enter! Today marks the first day of the Christmas BookTubeAThon and of course I didn’t bring my book into any of my classes to read after tests. Oops. I am going to be starting with Will Grayson, Will Grayson by John Green and David Levithan. 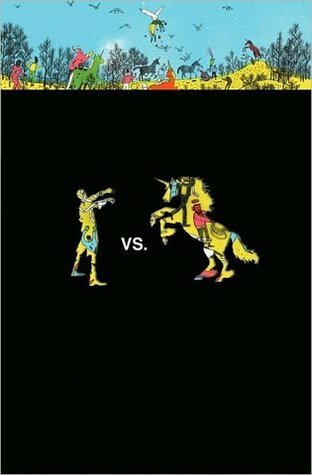 I am almost done with Zombies vs. Unicorns and am about 75 pages into Clockwork Angel. I plan on reading a lot of books over Christmas break even though it’s only two weeks. I am going to allow myself to only watch half an hour of YouTube each day of break so then I can catch up on my reading. Merry (early) Christmas! So, technically didn’t open right up to this page, but this is my favorite part of this book. This book is genuinely hilarious…and scary…and weird. It’s a good mixture of randomness. Definitely Team Zombie, though.